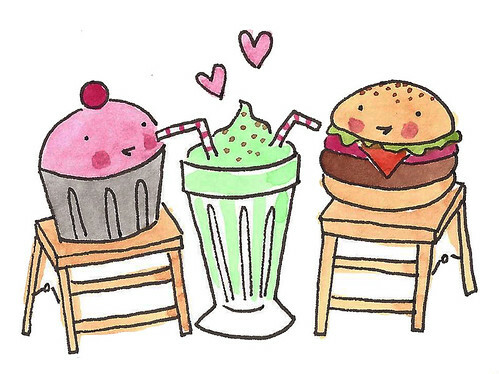 Does Cake Taste Different Depending on Your State of Mind? Cake always tastes delicious. That's a fact and nobody can take that away from you. But here's a question that, once it occurred to me, made me pause to ponder: does the same cake taste different depending on the time of day and your state of mind? Obviously, there was only one way to find out: I had to make myself a cake-eating guinea pig in this important experiment. So I made up a batch of cake--cupcakes, in fact. Vanilla with chocolate frosting. Actually, it was the cupcake version of my birthday cake from last year. So I know it's a cake I like. I put several in the freezer so they wouldn't go stale, and then rationed them out to myself over the next several days, experimenting with how the cake would taste at various times of day and centered around different activities. Oh, the things I do for science! Here's how it went. Wake n Cake: Cake eaten directly after waking up. That's right. I had the cake at the ready, so that when I woke up, I literally turned over to my night table, grabbed the plate of cake, and dug in (what I do for the sake of research!). Believe it or not, it isn't the first time I've done something like this, but it is the first time I tasted mindfully and really observed the experience. I still had morning breath and felt sleep-fuzzy, and the cake almost seemed like an interloper in my sleep world. My taste buds rejected it at first as foreign, odd. But the more I ate, the cake taste coated my mouth and I tasted sweet, not sleep. Not a bad way to wake up the taste buds, but I think I'll wait at least 10 minutes in the future before going for the cake. 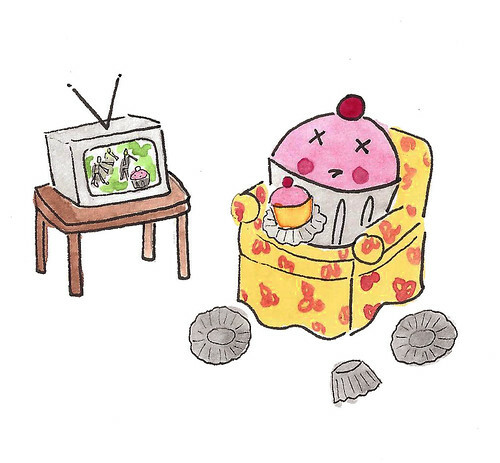 Cake Interrupted: Cake while eating TV. It basically went like this: I'm eating, I'm eating, it's sweet, and then it's gone. Wait, how did that happen? I realized that while the cake tasted good, I barely registered the experience. I felt like I'd had just a bite or two, and I wanted more. I can see why eating in front of the TV is not good for you--you don't eat mindfully at all! 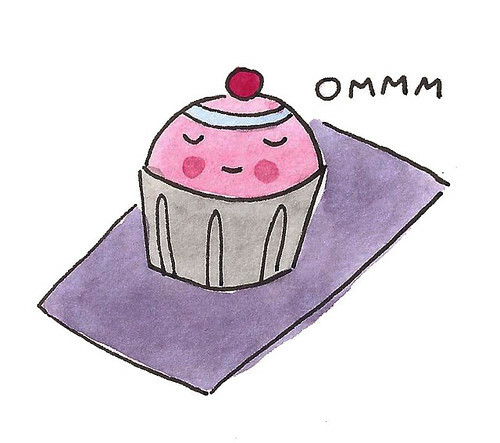 Cake OM: cake after yoga class. This was probably the best cake of all. I felt like my senses had been awakened by stretching my body, and walking outside into the brisk coldness and walking two blocks home, I felt invigorated. Still in that zen state of mind, I ate quietly, slowly, and mindfully. I tasted every bite, and every bite tasted like a sweet reward. I highly suggest eating cake after yoga or exercise. 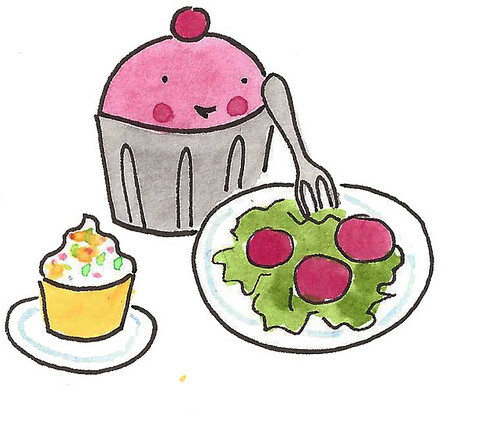 Virtuous cake: cake eaten after salad. Have you ever eaten a slice of cake directly after eating a salad? It's weird, man. You've got the natural sweetness of the salad ingredients--the crispy lettuce, carrots, etc. And the tartness of the vinaigrette. Then you have a slice of cake, and it just tastes weird and sour for a few bites. Luckily, after the initial few bites my taste buds were acquainted with the cake, and I found it an enjoyable experience. But the first few bites were really not that enjoyable. Naughty cake: cake eaten post cheeseburger. I'm told that eating a fat slice of cake after eating a nice fat burger is not so good for you, healthwise. But I'm here to make an argument for its nourishment of the soul. The gorgeous contrast of the soft sweetness of the cake following the savory salty unctuousness of the burger is an absolute thing of beauty. It felt like yin and yang. I craved ice cream with the cake, or to have the cake slightly chilled for even more of a cooling, sweet contrast, but the room temperature cake seemed to do just fine. Verdict: Thumbs up. Cake Walk: cake eaten while walking around the block. Eating and walking is an interesting experience. For me, it is a mixed bag. It's enjoyable because I like the feeling of eating outside--the air on your skin, even cold, stimulates my taste. 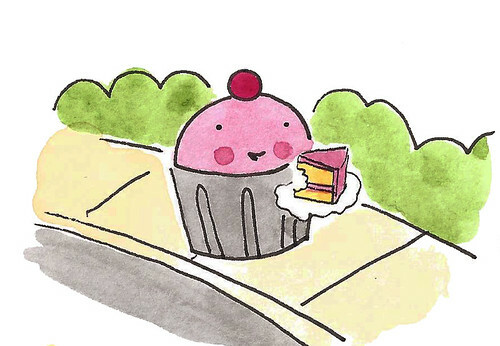 But eating a slice of cake (a strange food to be eating while walking) made me self conscious, and I think this took away from tasting because I was concerned about people looking at me. Verdict: thumb halfway. 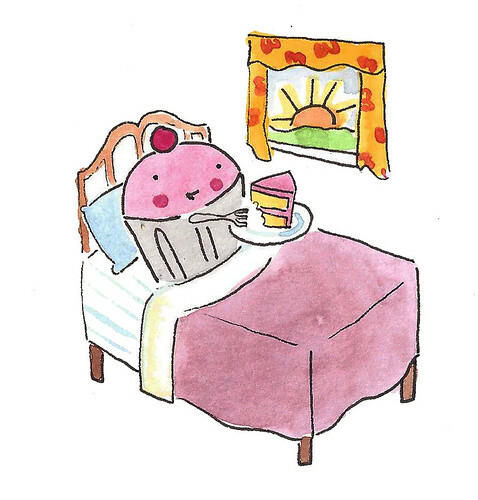 Cake Dreams: Cake eaten right before bed. 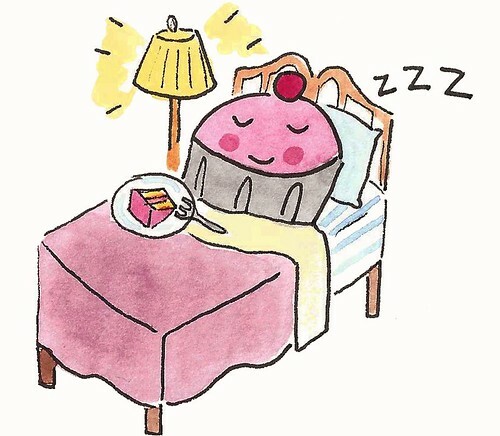 Do sweet foods give you sweet dreams? Well, I thought they might at first, because eating cake at night in bed is AWESOME. Not so awesome, however, is a half hour later when you're trying to sleep and find yourself all sugar-fired-up and ready to like, dance the macarena or something. Of course, I am not a big late-night eater, so this made me uncomfortable and too energized before bed.